...I was looking for minimalistic and simple To-Do app, that would provide practical and enjoyable experience. There are plenty of to-do lists/reminder apps, however, I felt that they are lacking the elements of pragmatism and motivation, that could be implemented to contribute to the overall experience. One thing that I miss in the to-do app is the ability to display the actual weather conditions that may affect scheduled goal/task - often found myself in the situation where "errands" tasks had to be postponed due to the weather conditions. I also examined one of the potential values, that it would be beneficial to display the number of steps made at the current day - it would deeply contribute to the sense of pride, besides accomplished tasks and user would feel good about it. To make it more personal, displaying users name could build a closer relationship, where user could rely on it's personal assistant. The navigation elements would be composed of essential elements Calendar, New Task and Projects. The idea behind it was to reduce the cognitive load from the user on the number of options and choices - app had to be fast to use and allow quickly capturing possible tasks. The three-point expandable menu allows user quickly choose area of interest, without much distraction and amount of choices. 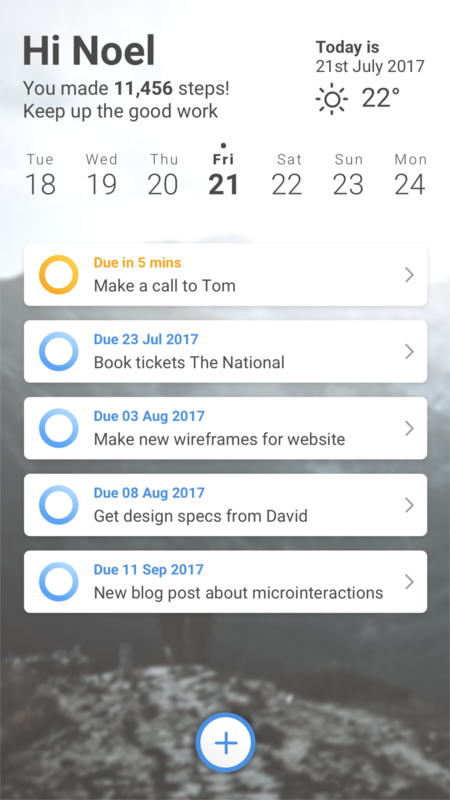 The way tasks will be displayed, are depending on time and date due: distant tasks will be displayed as blue (cold), and due soon tasks that require attention displayed as orange.